Be the first to share your favorite memory, photo or story of Donald. This memorial page is dedicated for family, friends and future generations to celebrate the life of their loved one. 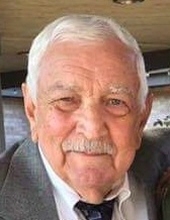 Schofield – Donald A. Traeder, 84, entered into his eternal home in the early morning of March 30, 2019 with his loving wife by his side at Mount View Nursing Home, Wausau. Don was born June 18, 1934 in Abbotsford, WI to Daniel and Helen (Beilke) Traeder, the youngest of four children. He was a 1952 graduate of Wausau High School and worked for Cities Service Station during high school. He was drafted into the U.S. Army and served two years in Korea as a mechanic. He was injured during his service and returned to Milwaukee, WI for his hospital rehabilitation. Once out of the hospital, he worked for Lou Ehlers auto dealership in Shorewood – Milwaukee, WI. Upon the death of his friend and mentor, Les O’Brien, Don returned to Schofield, WI to take over Cities Service Station. He married his girlfriend of many years, Joyce O’Keefe in 1959 and raised four sons together, in Schofield. He closed Cities Service in 1968 and worked for Drott/J.I. Case, Schofield, in assembly, becoming a heavy equipment demonstrator throughout the world. He ended his career working in the research and development department of the company prior to retirement. Don always loved cars and anything about them, at one point working in the pit for and racing with his brother, Gordon, during his racing career. He was a member of the Wausau Antique Car Club and seldom missed any car shows in the area, including annual trips to the Iola Car Show until his health prohibited such trips. He was a local neighborhood character, well-liked by his friends and neighbors for his mechanical knowledge and willingness to help with just about anything that needed fixing. He was a loving husband, father, grandfather, great-grandfather and will be missed by all. A private family service will take place at John J. Buettgen Funeral Home on Thursday, April 4, 2019, officiated by Deacon Mike of St. Therese Catholic Church. On line condolences may be expressed at Honorone.com. To send flowers or a remembrance gift to the family of Donald A Traeder, please visit our Tribute Store. "Email Address" would like to share the life celebration of Donald A Traeder. Click on the "link" to go to share a favorite memory or leave a condolence message for the family.